Malaysia 5 Ringgit pNew 2012 Polymer Banknote – Available for purchase at our eBay store. Plastic money (and no I’m not talking about the little cards that gets my daughters into trouble at the mall) is, in my opinion, one of the most interesting ideas in currency. Polymer notes (plastic money) are banknotes that are made from polymer and issued to countries instead of paper money. Not only do they last about 2.5 times longer than paper, but they are harder and more expensive to counterfeit. The first country to introduce polymer notes was Australia in 1988 as a response to their currency becoming easily counterfeited. With the polymer notes added securities were able to take form, such as transparent windows in the notes and microprinted watermarks. Australia 20 Dollars p53c. 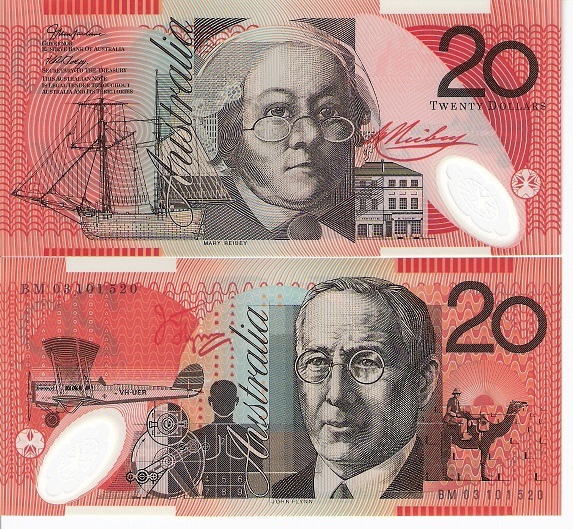 Australia as the first to introduce polymer banknotes to combat counterfeiting. Email robert@robertsworldmoney.com for availability. Hong Kong 10 Dollar p401 Polymer Banknote – Available for purchase at our eBay store. So why don’t more countries use polymer notes? It does seem like more and more countries are making the switch, however for others there are reasons to stick with paper. The startup cost, printing polymer money is more expensive than paper (though in the end it works out better, longer lasting, harder to counterfeit, ect) , however, polymer notes cost more to produce in the short-term, which could be a drawback for developing countries. Since the payback from their extra durability only comes over time, which some places do not have the luxury of waiting on. Some other “problems” with polymer people have found are that the notes tend to stick together when counting; also they are hard to fold in wallets or pockets. Another reason for sticking to paper is some less developed countries may not have the means to properly recycle polymer creating pollution to their air. Zambia 500 Kwacha p43f Polymer Banknote – Available for purchase at our eBay store. So the question is up to you, paper or plastic for your money. Many countries have jumped on the polymer bandwagon, Fiji being the newest up and comer with their new $5 note (check out my blog on that series too). I am excited to see what other countries start developing their own polymer series in the years to come. Perhaps America will be one of them! Vietnam 10,000 Dong p119 2009 UNC Banknote – Available for purchase at our eBay store.